So is it winter doldrums or pre-spring-training-game doldrums or what? I am in sort of a knitting funk, but if it is a funk, it is a very productive one. Perhaps I don't have the mental energy to take on a big project, so I've been buzzing through a lot of little ones. I was recently perusing the wonderful "Mason-Dixon Knitting" book (http://www.masondixonknitting.com/) [sorry, my linking thingy doesn't work in this version of Blogger...] at the store and was struck by the chapter on Log Cabin Knitting. I'm not a quilter, so this marvelous concept was foreign to me. It's as random or as orderly as you'd like, needs no pattern, is portable, and looks great. It only took a couple of hours to make this, and except for all the ends I had to weave in (you do NOT want to see the back of this thing), it was a really really enjoyable way to spend a few hours! I started with the white square-ish block in the middle, knit a few rows, bound off on the right side, picked up with the lime green, knit a few rows, bound off on the right side, picked up with the turquoise, etc etc etc, until it was the size I wanted. 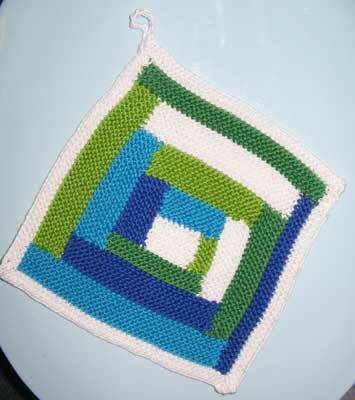 I finished with four white sides, crocheted a little loop with the last stitch, and done and done. No wonder they go so crazy for this over at Mason-Dixon Knitting! So when I get my big project groove back, I'll start a Log Cabin Blanket for Gus. It's for him to take to college, so I have eleven years to finish it. Not to toot my own horn, but this picture allows me to display a valuable-for-knitters-but-useless-for-everything-else talent that I have. This is the ability to halve balls of yarn evenly. 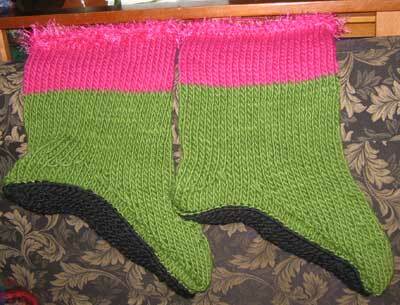 I had one skein each of the green yarn, but a big unmarked ball of the pink yarn and also the pink fuzzy stuff. 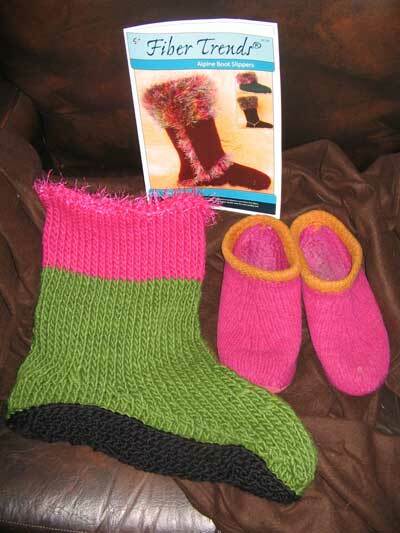 On the first slipper I knit till the the green ran out, then used what I thought was half of the pink yarns. Pretty accurate estimating, I must say!! At work, if customers want their skeins wound into two balls, I am always given this task because of my Special Talent. Please note manager Charlie Manuel on the right for scale. Charlie is a dainty 6'4". The truck is NINE FEET HIGH and like 25 feet long. It weighs 12.5 tons. Because it is a diesel, it actually gets pretty good mileage - 12 mpg. Lieber only used a quarter of a tank (200 gallon capacity) to drive from Mobile to Clearwater. Now he just has to make the team. I hope he does and drives it up to Philadelphia so I can see it. Maybe I could borrow it....... 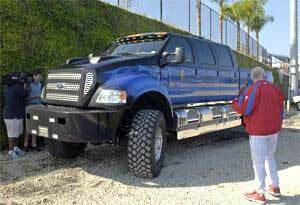 I can just see me dropping off Gus at his Quaker-y school in my NINE FOOT HIGH truck. That would rock!!! Go Lieber!!! got engaged over the winter. He now resents Dallas "Loose Lips" Green's remarks that he should tone down his legendary man-about-town antics off the field. Green drove stinkin' Scott Rolen out of town; let's see what he'll do about Burrell. Actually, as I mentioned in the comments a few days ago, I'm turning over a new leaf about Burrell this year. I'm all about the love - no more negativity from me! I think Burrell's going to have a great season this year and prove all of us old naysayers wrong! Really! Go Pat!! It is a scarf for Matthew's birthday, double-knit in the new love of my life, Blue Sky Alpaca Worsted Hand-Dyed. Oh how I love this yarn!!! It's $18 for one flipping skein, but you get 100 yds. When it came into the store, I kept thinking, "What a rip-off! How can they charge $18 for one skein? No way would I ever buy that!" Famous last words, of course. I finally succumbed to its siren song. 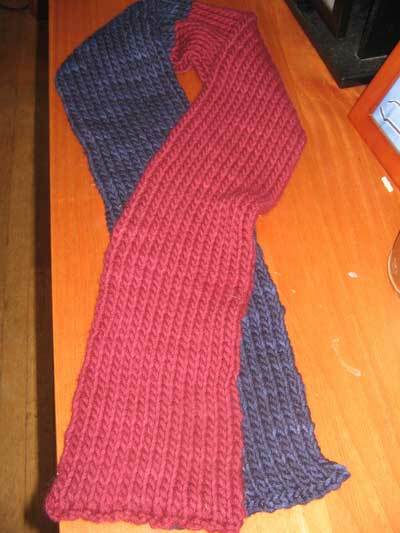 I knit the scarf on an #11 (and I'm a loose knitter - what's up with calling it "worsted"? ), so I actually got a decent-sized scarf for $28 (with employee discount, thank you). And let me tell you - it is SOFT and so dreamy to work with. I knit a sample hat in this yarn for the store yesterday at work, and it was a pure pleasure. Now I shall stop gushing. I've finished 13 repeats of the Cap Shawl edging, which means 195 stitches bound off. That leaves about 525 left to bind off, which means 35 more repeats of the edging. I guess that doesn't sound so bad.... I guess. It's actually sort of pleasant, mindless knitting - I've memorized the pattern so I can just pick it up and put it down whenever the impulse strikes me. I also finished these, a Spiral Rib Hat (Ann Norling pattern) and neck gaiter (from my brain) in Lorna's Laces Swirl Chunky, with a smidgeon of Blue Sky Alpaca Worsted to finish off the gaiter. 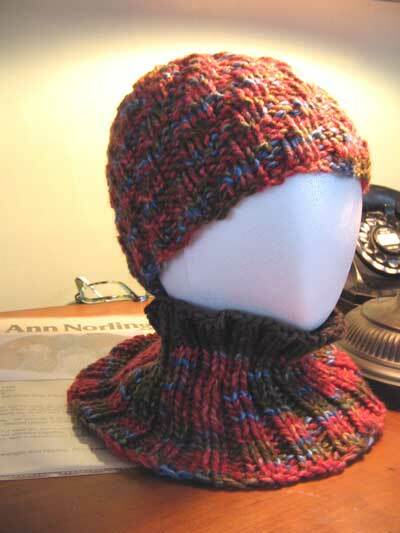 The Hat pattern is fun and quick, and I must say that a neck gaiter is the greatest invention known to mankind. 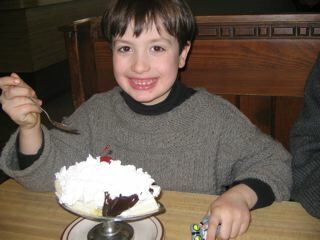 We walked to the diner on Monday morning for Presidents' Day breakfast, and it was COLD, and that ding-dang neck gaiter kept me completely warm and toasty. And no pesky ends to wrap around or keep track of. 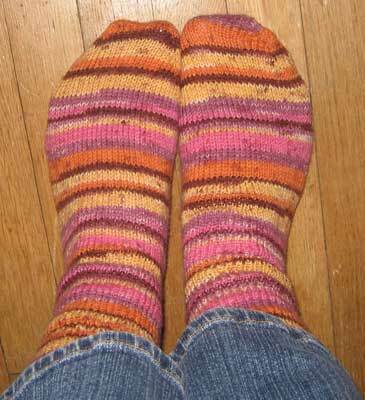 I also finished these yesterday at work - socks in an especially nutty Lana Grossa colorway. I knit one for the store and then (as ALWAYS happens whenever we knit a sample of anything), the color was discontinued, so Mary gave me the sock and the leftover yarn. They may be kooky-looking, but they're full of warm wooly-socks-y goodness, and though I made no effort whatsoever to get them to match, they actually match pretty well. Huh. 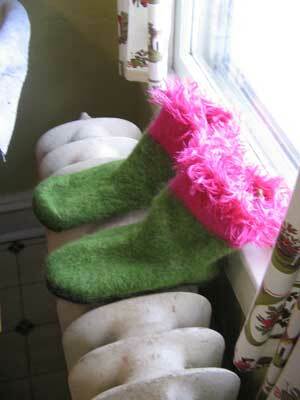 This is Fiber Trends Felted Alpine Boot. My Felted Clogs (shown here for scale) are getting a little tired (after being worn every single day for three years), so they are about to be sent to an honorable retirement. I like the idea of a boot-type slipper, so when this pattern came in, I thought I'd take it out for a spin. Don't be fooled by its super-giganticness; I'm actually making the lower size. The special thing about these boots? Every ding-dang inch of them is from stash yarn (but why did I have that fuzzy pink yarn??). Anyway, stash-busting! Praise the Lord! 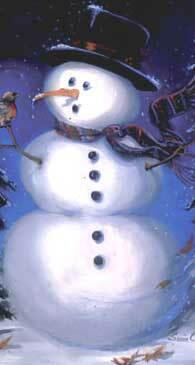 Remember when snowmen were supposed to look like this? 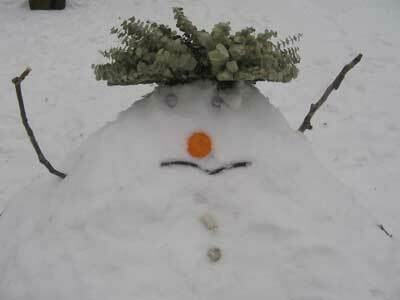 I assume that this is the image we all think of because I assume that this is how most people make a snowman. Now let me state for the record that I am a Pennsylvanian-born and bred. 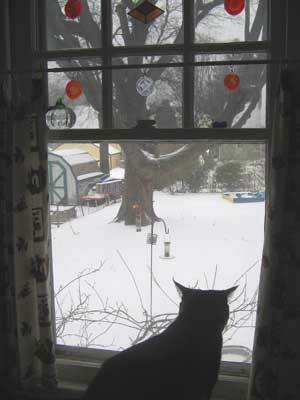 I am a veteran of dozens and dozens of healthy snowstorms - feet and feet and feet of good malleable snow. I am college-educated and also worked in construction for a year. I have a good grasp of spatial relations. I am not stupid. But I have never been able to make a snowman with that ball-rolling business. The snow is simply not structurally sound! Do other people know something I don't? I try and try and try with no success. 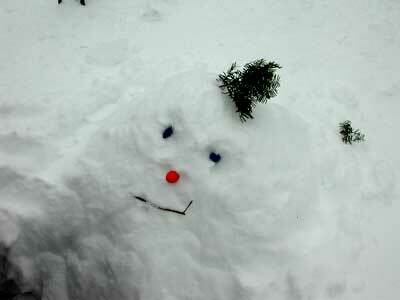 I begin each snowman-making session with unbounded optimism that this time will be different. But it never is. 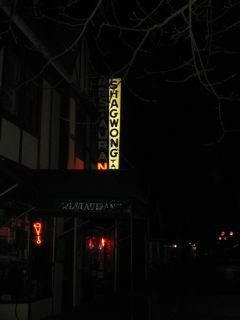 So let's take a stroll down the Mighty-Momogus-Jabba-The-Hut-School-Of-Snowman-Making lane. 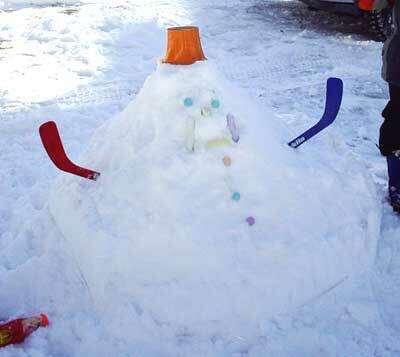 I actually like their sort of winning, squat Jabba-the-Hut-ness, but they do not resemble traditional snowman. 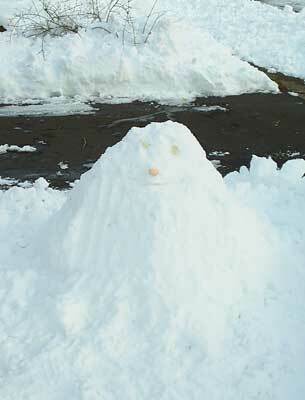 Would anyone care to weigh in with advice or the benefit of their snowman-making experience? But still, pitchers and catchers have reported, and like seeing the first robin, that is a no-doubt-about-it harbinger of spring! Yup - not only did Gus's school close, but the roads are so hazardous that The Tangled Web is closed too. I still have my pajamas on!! And it's lunchtime!! YAAAYYYYYY!!!!!! 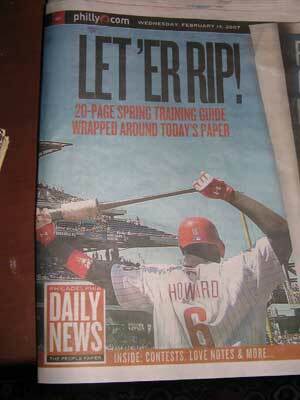 Phillies Preview in the Daily News - it gets no better than this. Tomorrow pitchers and catchers report, and The Dark Time will officially be over. Happy Valentine's Day - give someone you love a kiss and a hug today. 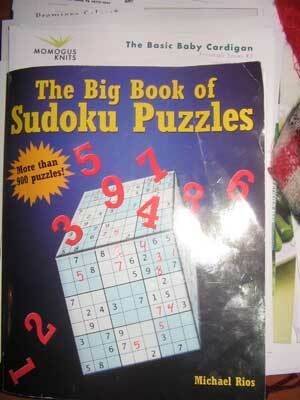 Hundreds and hundreds of ding-dang Sudoku puzzles. Oh yes, grasshopper, I became the flipping Sudoku Master!! 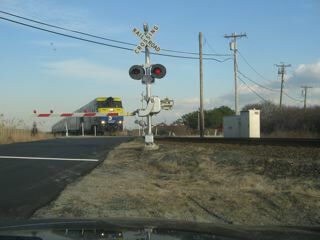 You see, the day before we were to leave I felt a tiny telltale twinge in my arm. Of course, I studiously ignored it. Oh no, it absolutely could NOT be my tendinitis flaring up. Not the day before my Luxurious Knitting Trip!!! Well, of course it was. I worked on the bitty shawl above on the car trip up, and my arm was barking so fiercely after a couple of rows that I had to put it down and face facts. There would be no knitting on this trip. After a couple of days I finally and tearfully put all the knitting projects away in the back bedroom; even Matthew was distressed for me. 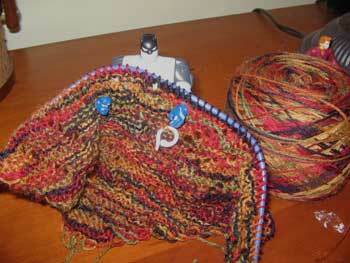 This is the knitted-on edging of the Cap Shawl. I have never finished a shawl this way before; it took me a few tries before I understood what was going on. 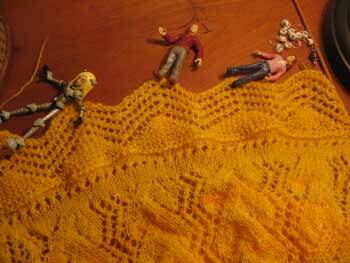 You cast 11 stitches on a double-pointed needle and then do a 30-row lace pattern - on every wrong-side row, you knit the last stitch of the edging together with the next stitch of the shawl itself. 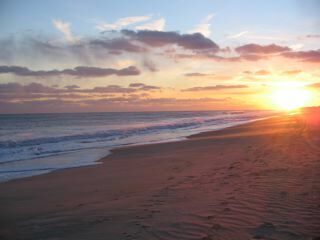 It's a beauteous way to finish it off. 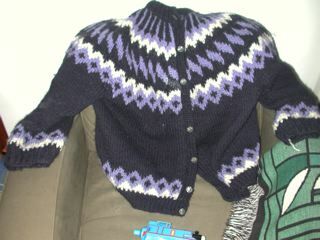 It would be the perfect time to knit backwards on the wrong-side rows, but I can't get the right tension when I try it. But speed is not the objective. I've done 5 repeats of the pattern, which means I've cast off 75 stitches (15 stitches cast off each repeat); which sounds like a lot, but I still have 623 stitches left. HA HA. So I'm not going to think about that too much. The nice part is seeing the shawl come off the needles little by little. I might faint when it's done (especially since I'll be in my 80's by then). 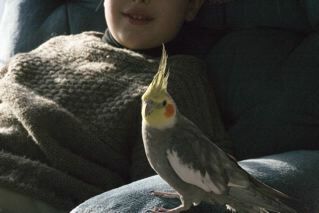 I confessed to Matthew that I find Festus strangely attractive, which must have bothered him on some (or many) levels. While we were eating, the man sitting next to us got up and came over and said, "I just wanted to compliment you on your boy. I've never seen a young man so well-behaved." 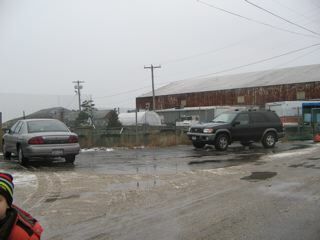 The Fish Farm, between Amagansett and Montauk, is at the back of the long rusty warehouse. You can get seafood that is fresh and delicious, and it is an adventure to procure it. It is patrolled by barely domesticated cats (Gus calls them "bobcats") and surly geese that will chase you off if they notice you. 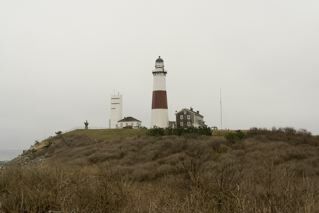 We went to the beautiful Montauk Lighthouse. 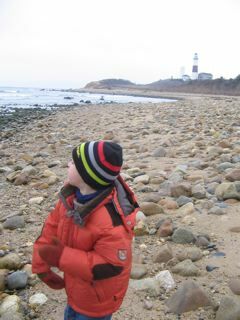 It's closed during the winter, but you can walk on the beach and throw stones in the ocean. This is very pleasant business, and we've whiled away a LOT of time doing this. 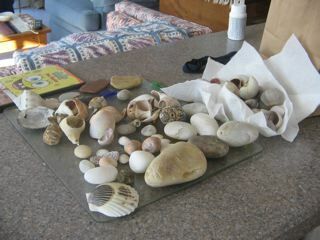 When you walk on the beach or by the Lighthouse, you must collect shells and good stones. These all come home with us every year and get deposited around the garden. 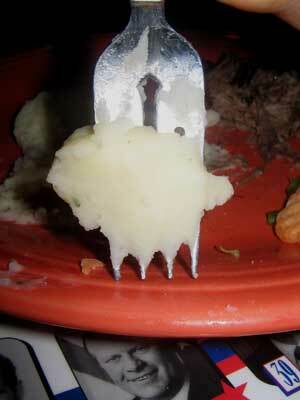 Hundreds of years from now, this will bewilder some intrepid archeologist. 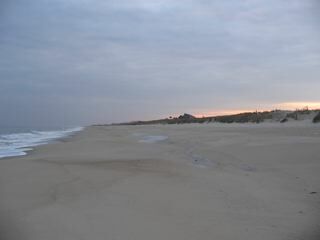 We prefer freight trains, but the Long Island Railroad screaming through the dunes is pretty impressive. I have so much to blather about the trip, I don't even know where to start. 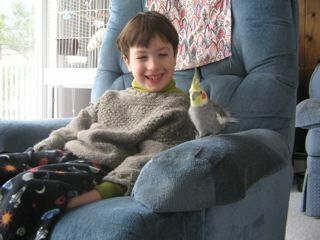 So instead, I will respond to Two Sharp Sticks contest/request to tell the story of how I learned to knit. My story is very anti-climactic. No doting grandmother lovingly teaching me at her knee, no fabulous knitting friend/guru to inspire me. Back in 1991 or 1992 (exact date lost in the mists of time and my faulty memory), I decided that I wanted to learn how to knit. So I bought a "So You Want To Learn How To Knit" kit from Woolworth's and some green acrylic yarn and taught myself how to knit. The end. 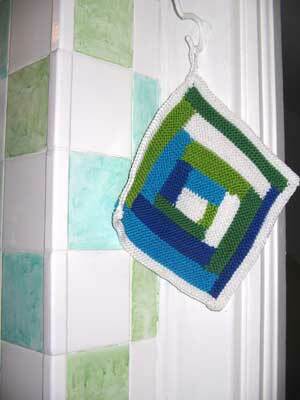 I was always "crafty" - I always liked making little things. 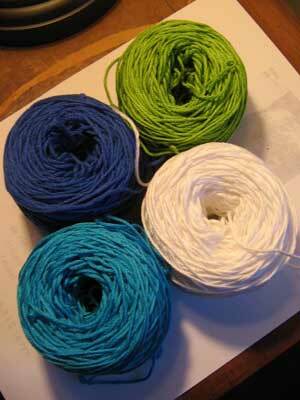 I taught myself basketmaking, needlepoint, calligraphy, crochet, among a million other kooky crafty things. 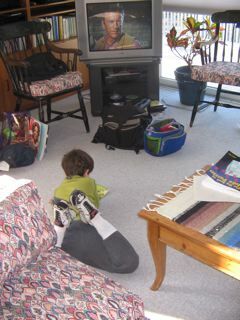 To this day, nothing pleases me more than getting a book and the supplies and trying to figure out how to do something. Not that this is the best or most efficient way to learn, I've found, but the most enjoyable for me. 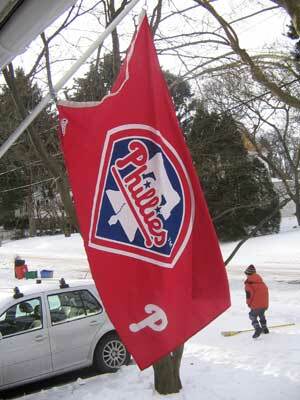 Tomorrow, trippy goodness, and, even though it is 18 degrees here in Philadelphia, it's time to think Phillies Baseball! !